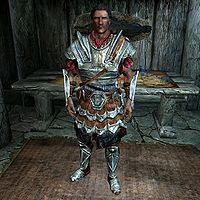 Taurinus Duilis is an Imperial soldier, and Legate of the Imperial Legion, stationed in Morthal. During the day he is found in the war room of Highmoon Hall and at night he sleeps inside the Morthal Guardhouse. Taurinus is clad in a set of Imperial heavy armor. This includes an Imperial armor, a pair of Imperial bracers, and a pair of Imperial boots. He is equipped with an Imperial sword for close-range combat, and uses an Imperial bow supplemented with thirteen steel arrows when the need arises. He also carries a steel dagger. After the Civil War Questline, if you sided with the Stormcloaks he will be found at the Hjaalmarch Imperial Camp. Since he retains his essential status he can not be killed in an ambush on the camp. If you fast travel to Morthal at dusk you may find him standing outside the guardhouse all night long, locked out since he doesn't have a key. This page was last modified on 18 March 2017, at 19:06.